Hi everyone! My name is Brianna Hatcher and I am the voice of the blog Morning Coffee and Truth, and today I’d like to talk about one of my newest obsessions; bullet journaling! If you’ve been on Pinterest or Instagram, you’ve probably heard of this new trend. It’s exploding all over the internet! If you’re not sure what it is, check out bulletjournal.com to see the original concept. Ryder Carroll developed this system of rapid logging to help with his ADD and to keep his life organized and productive. Since he started this 4 years ago, it has evolved and turned into a whole new breed of planning and organization. People have added so many different pages to what the creator had, and the creativity of everyone’s personal journals is inspiring! 1. Future Log: Some form of future log is pretty common in bullet journaling. Since it starts out as a blank notebook, and often, your spreads are only a day or possibly a week ahead, what do you do with appointments that are scheduled in a few months? That’s where the future log comes in. You can jot it down when you schedule it, and then when you get closer, you remember it easier! 3. Habit Tracker: Another very popular spread, habit trackers help you track things you should be doing on a daily basis or to see how you do with tasks over a monthly time period. For me, I track things like drinking enough water, remembering to take medication, if I exercised, and if I posted on different social media platforms. I’ve tracked things on both a weekly and monthly basis. You just have to do what works for you! 4. Mood Tracker: I’m a big fan of some form of a mood tracker. It helps me spot trends and patterns in my moods, as I deal with anxiety and depression. 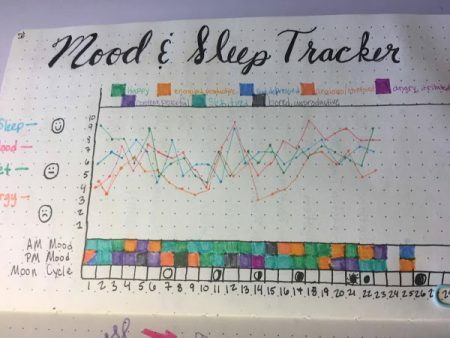 I’ve done this in multiple different ways, and my favorites were the One Line a Day – where I could write why I was feeling a different way – and My Current Tracker – this graph that tracks my diet, sleep, energy and mood on a numerical scale with colors that represent my mood for the day part. I really like this because there’s so many different things that affect my mood, so seeing it all in one place really shows me how everything correlates together. I also have the cycles of the moon here because I wanted to start tracking how that affects my energy and mood. This mood tracker is accompanied by my long form journal so that I can see exactly why I was feeling a certain way. 5. Gratitude Log: This is one of my favorite spreads in my bullet journal! It really forces me to reflect on the day and find something positive that happened during the day, even if it was something really small. Even when I was having a terrible day, writing down that small thing like Starbucks, made me smile and made my day just a little better. It’s important to remember that what makes bullet journaling unique is that it is personal, and you have to make your bullet journal work for you. These spreads are staples in my journal, and they work for me. But you have to figure out what works for you and create spreads that are personal. Don’t copy a spread, just for the sake of “it’s popular” or it looks pretty. Do what works for you! Brianna Hatcher is the voice behind Morning Coffee and Truth. She is an avid fan of bullet journaling and hopes to see people create fulfilling lives through productivity and organization. She lives with her husband and two dogs in Salt Lake City. Comment below with pictures of your newest bullet journal creations. We want to see them!